Imagine a world where individuals working in all sectors collaborate to solve our toughest social, economic, and environmental problems. It’s hard to do, because for decades, we’ve approached these challenges through siloed solutions, whether policy, market-based, or social programs. And very few of these attempts have been sufficient to address the problems at the scale which they exist. This is because our problems are not a result of one policy, investment or program—but an interaction between many of them. And as Albert Einstein noted “We cannot solve our problems with the same thinking we used when we created them.” This is why we need a movement of leaders equipped to work differently–across silos and sectors—in cross-sector collaborations. Cross sector collaboration isn’t new. For decades people have been building alliances of individuals working within and across sectors that together have a role in solving a problem and achieving a shared goal. What has been changing in the last decade is the urgency for and amount of focus on this way of working. The urgency for cross sector collaboration has developed because of the growth of and increased complexity of some of our most pressing problems – social, economic, and environmental — has been outpacing the scale of solutions. The focus on cross sector collaboration has grown as more government and philanthropic investors – and even some investments in capital markets – are requiring it of their grantees and partners. 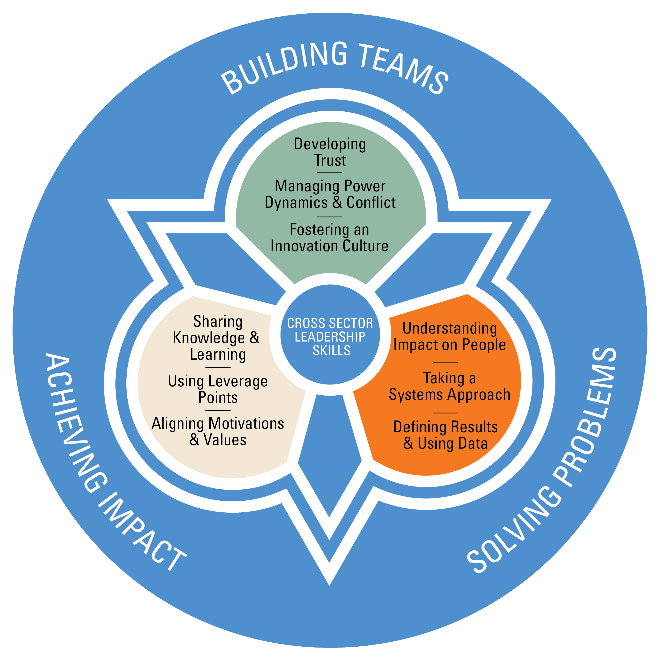 While the individual practitioner is the participant in a cross sector collaboration, more often than not, the practitioner are serving as a representative of an organization that has an interest in solving a problem and achieving a shared result. The individual’s ability to be effective in bringing the work of the collaboration into the organization, and aligning the organization’s values, practices, and policies with the goals of the collaboration is directly linked to the organization’s readiness and capacity to engage, including the strengths of its internal operations and systems, its internal culture, and if there is sufficient capacity for cross sector collaboration as part or all of an individual’s role (as opposed to being an added-on job responsibility). 1) Developing Trust: How do we create space to understand one another’s experiences, work, training, and pressures? | How do we build and maintain empathy for one another and commitment to the work? | How do we build the resilience to be able to speak frankly without fear? 2) Managing Power Dynamics & Conflict: How do we acknowledge power dynamics? | How do we bring a lens of diversity, equity, and inclusion to the work that we are doing? | How do we approach and enable conflict to occur productively? 3) Fostering an Innovation Culture: How do we build a learning culture to our cross sector work? | How do we create a culture of continuous improvement? | How do we make ourselves open to new information, ideas, and ways of developing solutions? 4) Understanding Impact on People: How do we better understand the problem by understanding the experience with those it directly affects? | How do we help people and organizations see how they are contributing to the problem? | How do we build a process of reflection and analysis into our practice in order to continue to refine our understanding of that problem? 5) Taking a Systems Approach: How do we support one another to see the system? | How do we enable all collaborators to be able to take off their organizational/individual hat and put on their systems hat? 6) Defining Results and Using Data: How do we help a cross sector effort define its results and identify leading indicators? | How do we use qualitative and quantitative data to inform decision-making? 7) Aligning Motivations & Values: How do we work to understand one another’s motivations and values? | How do we work to align financial, intellectual, human, and social capital to achieve impact? 8) Using Leverage Points: How do we identify the “right” leverage points to produce the intended results? | How do we develop strategies relating to those leverage points? 9) Sharing Knowledge & Learning: How do we build mindsets and create a culture where collaborators can share what they’re learning in as close to real time as possible? | How can we learn from communications and behavioral research to tell our stories effectively? | How do we make what we’re learning open and accessible to others? For decades, people and organizations have been engaging in cross sector collaboration. However in the last decade, there has been significant growth in sharing the stories and processes of their efforts. By learning with and from leaders practicing cross sector leadership, and those that study, chronicle, and codify their work, there is an opportunity for practitioners to explore the known known models of cross sector collaboration and what results are they best equipped to produce. As well as what differentiates cross sector collaborations that have had measurable impact from those that have not. This post was written by Alison Gold and originally appeared on Presidio Institute‘s website; it is republished here with permission.